Taxes are added in Back Office and applied to orders according to the configuration. In the Taxes settings, set the tax rate, choose which items carry the tax, and what type of service the tax applies to. To configure taxes for Rezku POS log into Back Office. ● To add a new tax to the list, click + Tax. The New Tax window appears when you click the + Tax button. In this example, we’ll go through the basic settings for creating a tax. The example is named State Tax. 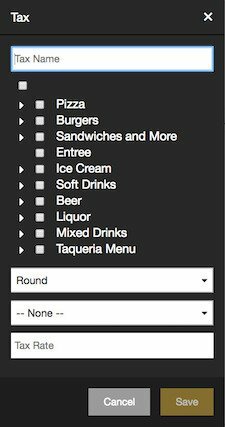 To apply this tax to everything on the menu, use the top check box. This selects all items on the menu. 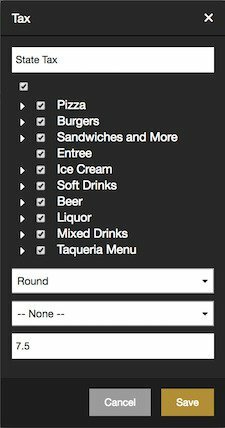 The first drop down box selects the rounding method. It is set to Round, which will round up or down, depending on what’s closer. The tax rate in this example is 7.5%. ● Click the Save button to finish. The new tax appears in the taxes list and will be applied to all new orders. For this example, we’ll add a tax using some different settings options. ● Click + Tax to open the new tax window. The tax is called Alcohol Tax, and it only applies to some items and services. The rounding method has been set to Ceiling, which means it will always round up. The tax rate has been set to 2%. The new tax appears on the list when we click save. To edit a tax, click the Pencil icon on the row with the tax name. Let’s take a look at these new taxes in action! The tax amount appears beneath the subtotal as each item is added to the order. 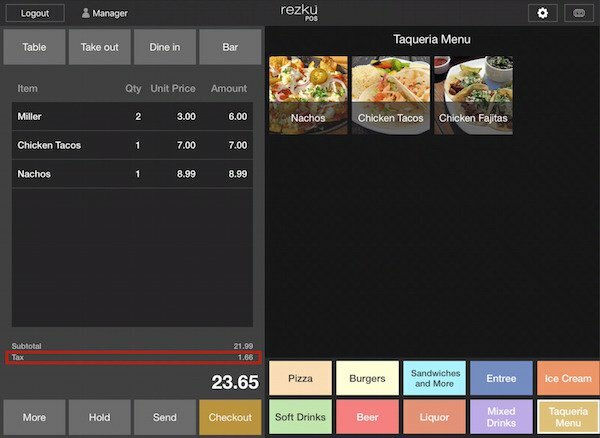 In Rezku POS, taxes created in Back Office have applied automatically to the order according to the configuration.